Hi all - long time no post! I've just upgraded my trusty old Vostro 3560 from an i3 to an i5, and it's running quite a bit toastier (75*C under load with the i3, but now peaking at 90*C with the i5), despite the two processors both having a 35W TDP. I've done some digging and it seems the chassis for each model is the same, and the only difference is that the ATI chip is physically missing from the motherboard. My understanding of how heatpipes work is a tad limited, but am I right in thinking that if I replace the heatsink with the GPU version, the heat should be distributed to an extent across both sections, and thus this should lower the temperatures a fair bit? It should in my eyes, more surface area = more heat that can be dissipated. Not to mention that the fan may also be a little better as its built to cope with a higher load than just a single CPU. 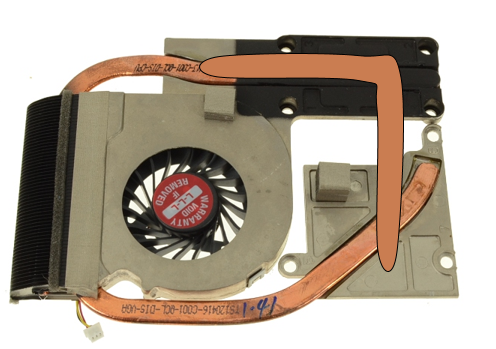 the cooling from the cpu will not be any better as it is still the same, single, heatpipe removing heat from that area. with no gpu chip the 2nd heatpipe has nothing to touch and no way of conducting heat. but as ian said if it has a bigger fin array or better fan that might help with temps some. refitting it with liquid ultra type tim will help best imo. Cheers guys - going to try it for science(tm) and will report back. I think that extra slab of metal behind the fan (it's just plastic on the UMA heatsink) might also help too so it could go either way. We need more ghetto type projects like this! I miss doing them. Any idea how to remove the fins off the donor heatsink though, without heating it up to solder temperatures (which are scarily close to heatpipe explosion temperatures)? I'm thinking may be bathe it in boiling water and apply pressure with pliers? 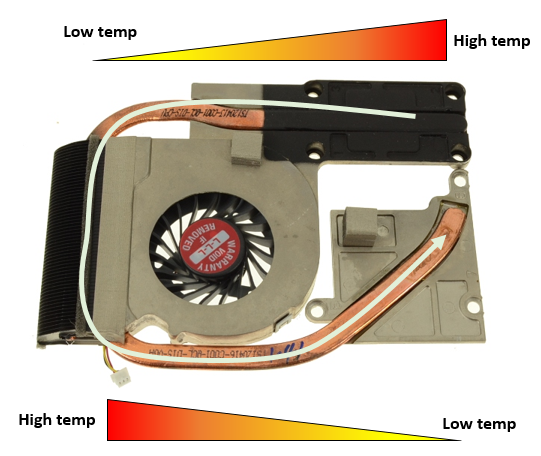 It might take longer to reach temp if its one continuous heat pipe but the dissipating mechanism is the fin array and if thats denser with the GPU included version then you should get better temps. In theory, it should improve but the best way to find out is to do it - keeping in mind that fresh, decent thermal paste may also improve temps by default. it would to some degree, but as for how much it would help, if you would notice real world...it would be just guesses. i mean in theory i think you're right but the heat would only go to the 2nd pipe and stay there. the cooling would still only come from the fins. it could be it would take a little longer to hit the max temps, but they would still be about the same. Hello again my dudes, I was recently given another dead Vostro 3560, that fortunately had the GPU version with heatsink and backplate. Although I attempted some component level repair on the dead board and got it to fire up, it still won't POST, so I decided to use it to do a slightly neater version of this mod on my working system . 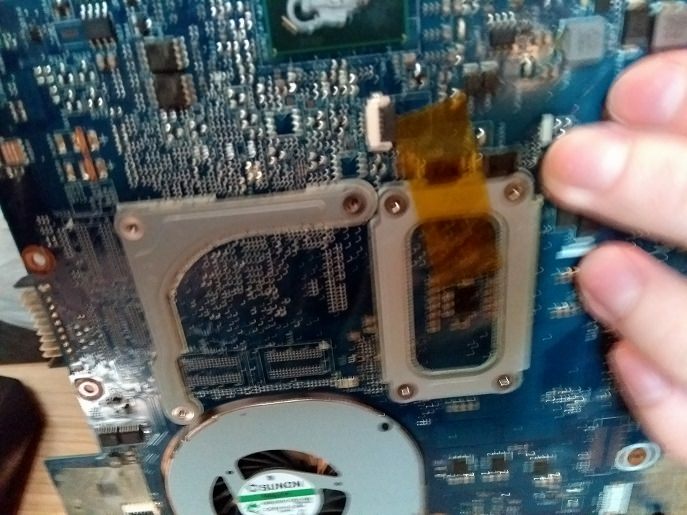 Much more robust than my first attempt (which held the GPU section in place by kapton tape and hope! ), and temps dropped greatly - the UMA heatsink was peaking at CPU 92*C+~ usually with the fan running full tilt. Under the same usage conditions, the CPU package now peaks at 70*C, with the fan not running at full tilt (nb, thermal paste was new on both measurements). Idle temps are still 50ish, but that's to be expected as this is the temperature that causes the fan to switch on. In all, I consider it to be a great success! I might have a go at adding a fan grill to the system, as with the UMA version temps would drop about 15*C with the back cover removed. I'm not sure if I'd see the same improvement now given that the fan is no longer running at full tilt but it may be worth a shot. Last edited by spleenharvester; 19-01-18, 00:51. Worth noting as well that if I disable the fan via HWiNFO, the system sits comfortably between 50-60*C while browsing the internet - before the mod the temp would just keep rising and rising uncontrollably if I did that, so I'm fairly sure the heat is indeed finding its way into the GPU section! Back again! I upgraded the i5-3380M to a i7-3612QM and while I was at it, decided to attach an extra heatpipe from CPU->GPU section by suggestion of a few people here. 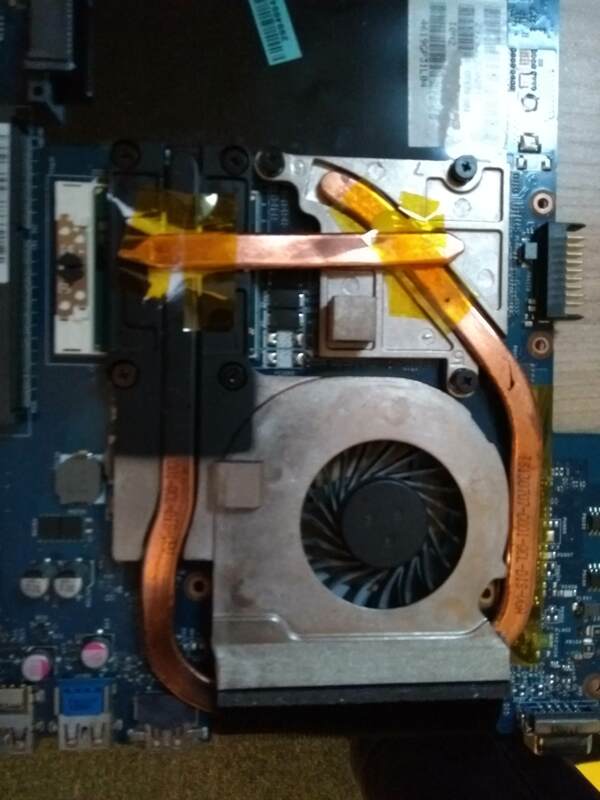 I bought the heatpipe from some far-East seller off ebay for a few quid, then attached it to the heatsink with Arctic Alumina adhesive (30 mins, clamped down with some clothes pegs). The Kapton tape is just there as a fail safe in case the heatpipe ever works lose, but the bond seems to be really strong. It now idles with the i7-3612QM and new heatpipe at 45*C passively, fan never kicks in unless gaming (and even then load temps average only 65*C), so great result! 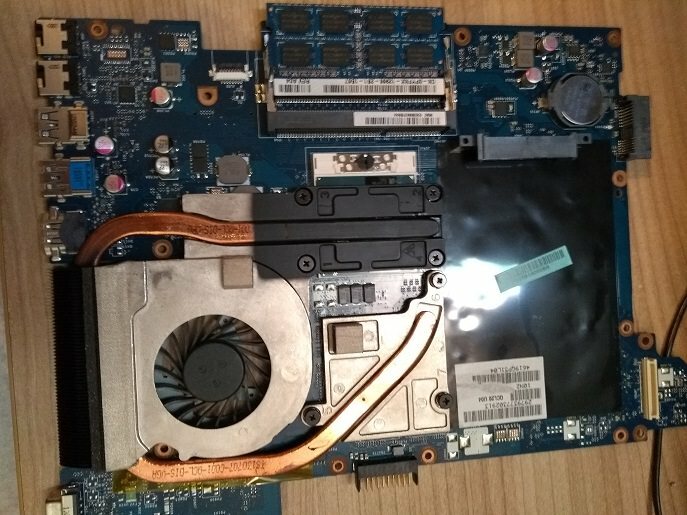 It's a shame I never got to compare before/after heatpipe addition with the same CPU, but this laptop is such a PITA to disassemble that I just didn't have the time or patience to do so.